This recording is the twenty-second opera by Donizetti from Opera Rara. It was a major objective of the company’s progenitors to establish a core of recordings of the composer’s works when they conceived Opera Rara more than forty years ago. Along the way there have been many trials and tribulations. Not least of these was when the long running financial support from the Sir Peter Moores Foundation finished as it drew in its horns in financially supporting arts endeavours. Consequent on that, Opera Rara has concluded a tie-up with the BBC and a change in artistic leadership with Sir Mark Elder taking an upfront position as Artistic Director. The first fruit of the liaison with the BBC was the recording of Caterina Cornaro (see review). This second is equally welcome in concept and realisation. It should also be welcomed that the recording has appeared sooner than some previous ones. Also, the more observant enthusiasts will have noticed that it was possible to get an advance feel for the music when the performance was broadcast on BBC Radio Three one Thursday afternoon a couple of months before its release. One can only express the hope that the new alliance prospers and that the unequalled efforts of Opera Rara in bringing largely neglected works, particularly by Donizetti, into the public domain continues long into the future. There are plenty more neglected and unrecorded Donizetti operas, of musical quality and interest. There are some seventy such works in his oeuvre. When faced with a work that I do not know intimately, I like to listen several times to get a feel for the music and particularly if it represents any significant change in approach or complexity on the composer’s part. At the time the Belisario discs came for review I was also scheduled to review staged performances of three Donizetti operas. These were, Anna Bolena (see review), Maria Stuarda (see review) and Roberto Devereux (see review) written six and two years before Belisario and one year after. I waited until those experiences before coming back to listen closely to this recording again. Belisario was the immediate successor to Lucia di Lammermoor, first seen in Naples four months before. It was given its first performance, at Venice’s La Fenice in February 1836. In between, the original version of Maria Stuarda, banned in Naples, was premiered in Milan. The melodic lines of Lucia found great favour - a great success. However, Belisario was the last work of the Venice carnival season and was hardly, as Jeremy Commons’ informative essay explains, venturing into a welcome environment. Utterly different in tone and orchestral complexity from Lucia it was, nonetheless, received with great enthusiasm and given a further seventeen performances during the season. It went the rounds in Italy and was staged in thirty-one cities abroad including London and America. However by the end of the century it had disappeared only re-appearing in 1969 (The Bel Canto Operas, Charles Osborne, Methuen 1994, p.246). The opera tells the story of Belisario’s betrayal by his wife Antonina. He is blinded and put into prison before finally being cleared. Proof of his innocence comes too late and he dies of wounds from his previous battles whilst his wife begs his forgiveness. Each of the acts are titled: Il Trionfo (Triumph), L’Esilio (Exile) and La Morte (Death). 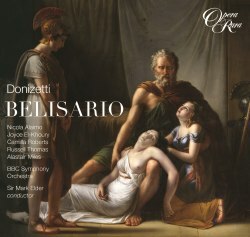 Rather like early Verdi operas, Belisario has major choruses, duets and a death scene. The influence of Donizetti on Verdi is evident in the latter’s early operas. It can also be argued there was reverse influence after Donizetti attended the premiere of Nabucco at La Scala in March 1842. This earlier work has hallmarks that became particularly associated with Verdi, especially the father-daughter duet at the end of part two (CD 2 trs.6-9). Somehow or other, Opera Rara manages to bring relatively unknown new voices to the fore in their recent recordings; none more so than in this performance. The singing of Sicilian Nicola Alaimo is tower of strength in the eponymous title role. I admired him as Count Rodolfo in the recently issued 2008 performance of La Sonnambula (see review) alongside Eglise Gutierrez as a superb Amina and who appears in Opera Rara’s recording of Linda di Chamonix, (see review). Nicola Alaimo could become the Italian baritone of his generation. Belisario’s prisoner Alamiro is portrayed with some vocal strength by lyric voiced American tenor Russell Thomas. I last heard Thomas as Pinkerton in 2009 (see review), a year after hearing him as Tamino (see review) and feared that the step from Mozart to the dense orchestration of act one of Butterfly might be one step too far for a young voice. Except at the very top of his clear lyric voice, his contribution in this recording is significant. Of the ladies, Joyce El-Khoury, as Antonina, Belisario’s wife, is a formidable talent whose open-toned voice allied to vocal sensitivity and characterisation is too rare these days. I was sorry that the evolution of the plot did not give greater opportunity to hear her between the part one scene and cavatina (CD1. Trs. 5-7) and the long finale which concludes with her stunning high note (CD2. Trs. 18-22). Joyce El-Khoury’s contribution is matched by the gentler soprano of Camilla Roberts as Belisario’s daughter, Irene. I have already referred to Irene’s duet with her father to which she brings beauty of tone along with commendable legato and vocal expression. These qualities are also evident in her singing of Irene’s opening cavatina (CD1 Trs. 3-4). Elsewhere Alastair Miles, long-time performer on Opera Rara, contributes a characterful Giustiniano as does Peter Hoare as Eutropia. The BBC chorus are tremendous and Sir Mark Elder provides an ideal catalyst. I described him as an inspirational conductor following the recent Hallé Orchestra Verdi bicentenary concert in Manchester (see review), and can think of no better description here. With his long association with leading opera houses, he knows what singers can and cannot do and how to coach and coax the best out of them. Similarly his association with the quite magnificent Hallé Choir over the last twelve years has brought out the best in both. Opera Rara, like the Hallé, is lucky to have him. His vast knowledge of opera and sympathy for the bel canto period should be invaluable in this new arrangement between Opera Rara and the BBC. Nor should we forget his love for and knowledge of Verdi.